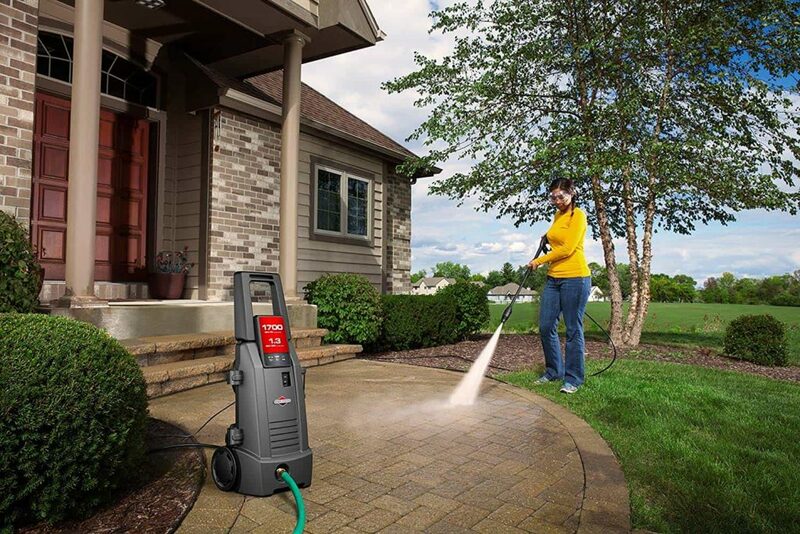 A pressure washer is a useful addition to any household. They have a multitude of uses in all seasons and come in many shapes and sizes. 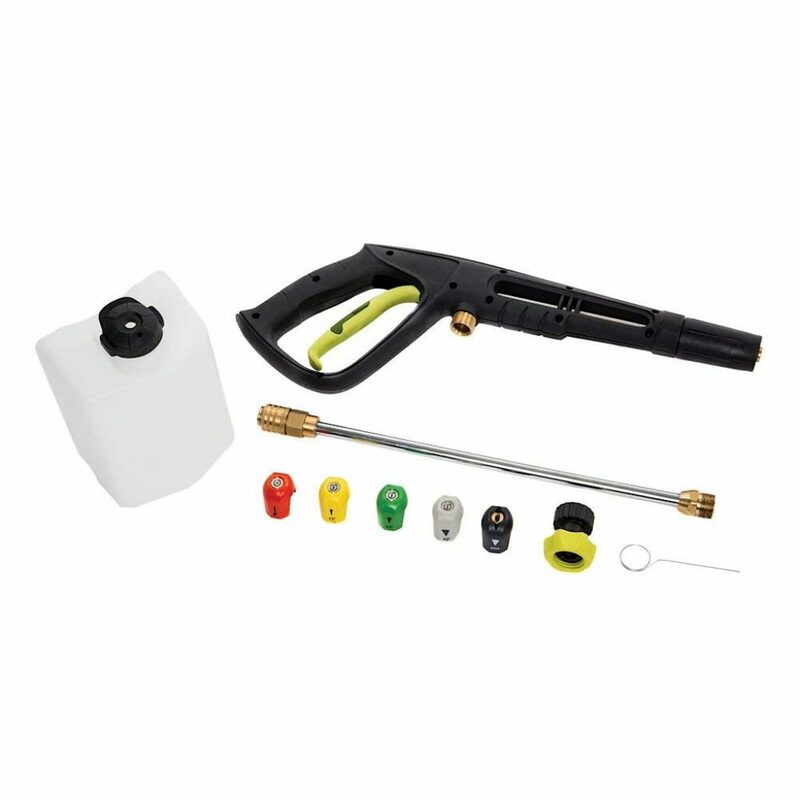 From tiny units with a short hose that you have to carry around, to large trolley-style machines with on-board storage for an array of cleaning accessories. 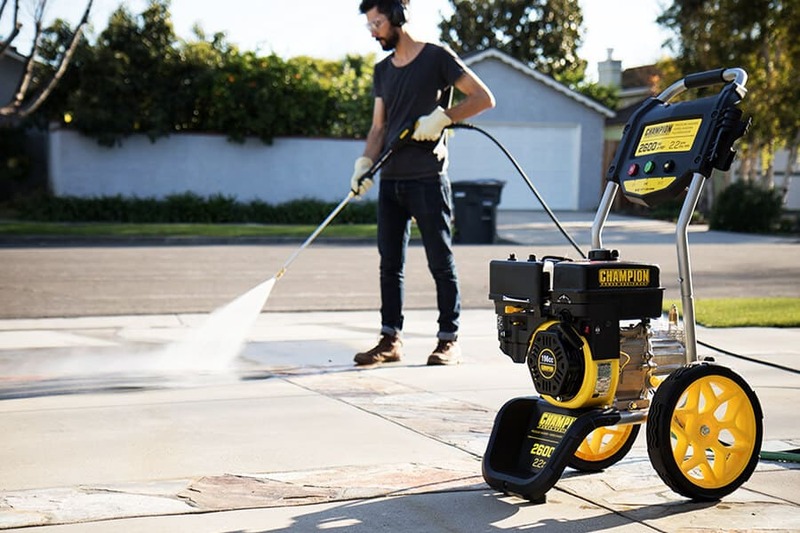 As a minimum, you’re going to need detergent, a tap connector to the hose, and a hose pipe in order to successfully run a pressure washer. However, you’ll probably want some accessories to increase its cleaning capabilities. Brushes, scrapers and angled or extension wands will allow jobs to be completed faster and with less hassle. 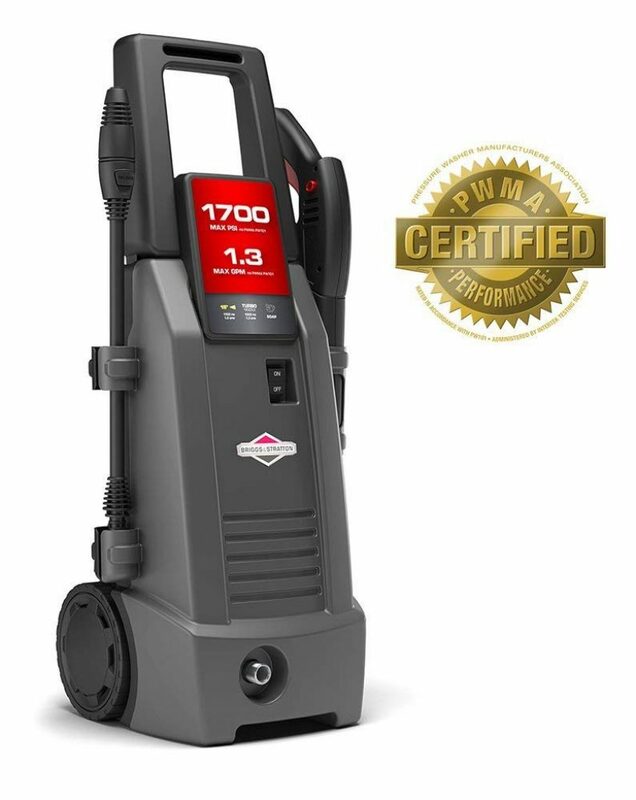 There are also many specialized chemical cleaners designed for pressure washers, but, as always, take note of any precautions listed. With certain tasks, such as car cleaning, stick to the lower end of the bar range in order to prevent damage to your paintwork; however, for patios, or driveways the higher the better. So, it’s a case of finding a balance. You should note that the heavy-duty models tend to be noisier, and there’s a possibility that they might damage some surfaces if you’ve never used one before. Another big consideration is gas or electric. The more heavy duty washers tend to be gas powered, but the lighter, electric models are cheaper, easier to handle, quieter, and in many cases, less risky. But, cleaning will take longer. Finally, for practical purposes, weight and wheels should also be considered. Some machines can be heavy and if, for example, you have a lot of steps in your garden, you might want to steer clear of something that’s too troublesome to lug around or go for one with a longer hose. A longer hose could also be useful for larger gardens or when cleaning a car. 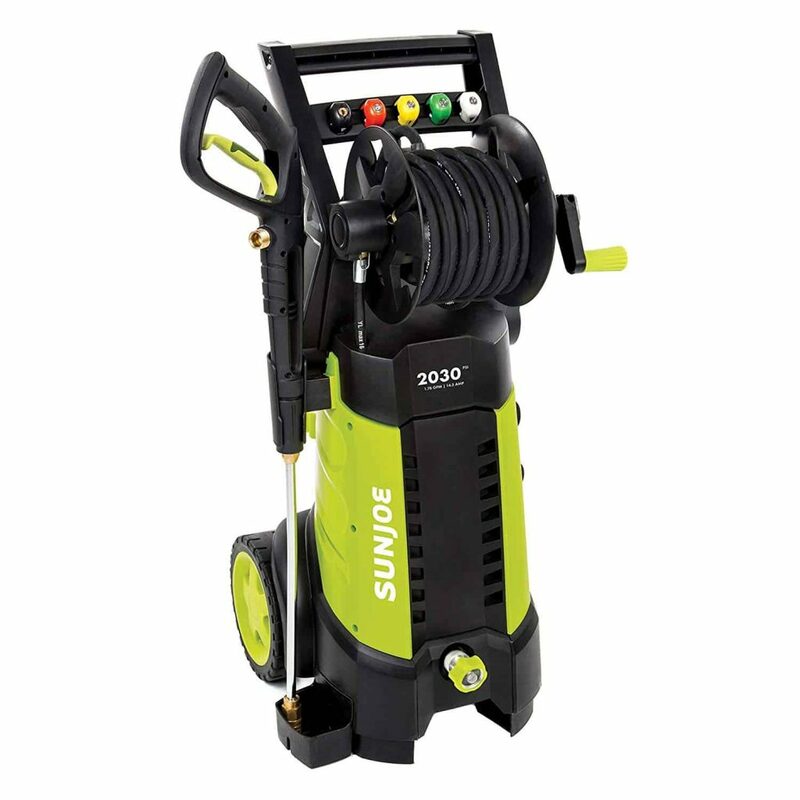 Sun Joe is a well-known brand in the pressure washer world, developing electric pressure washers for residential use, and this model is one of their flagship designs. It’s lightweight, has a small, neat footprint, and is collapsible for easy storage. The color is great, and despite the super price band, it seems sturdy and well made. Very quick to set up, we were ready to pressure wash within minutes. 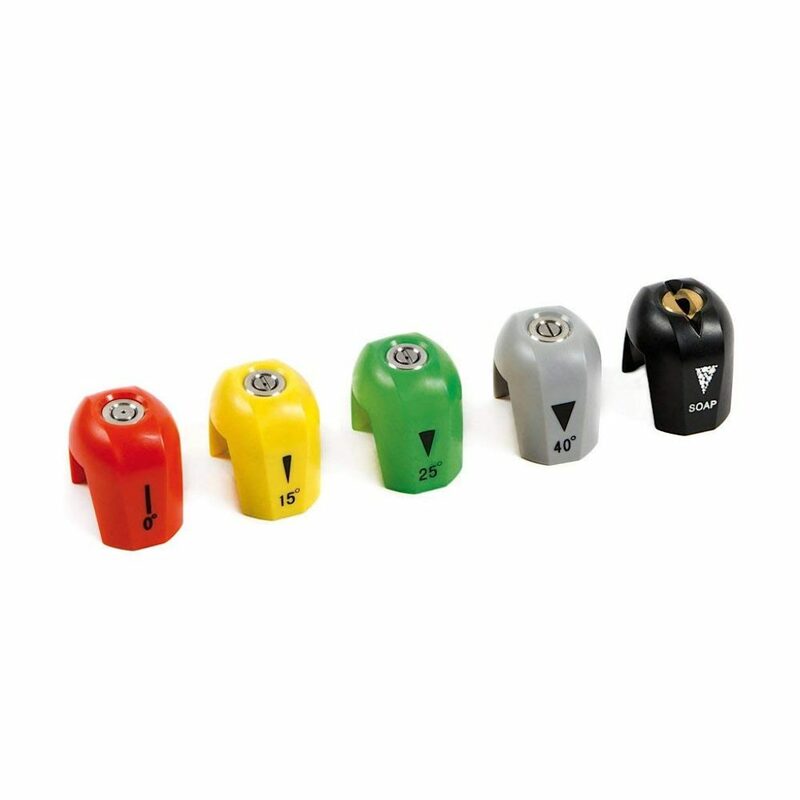 There are plenty of useful attachments that come with the SPX 3001; five different nozzle tips are provided starting from 0-degree pencil point water flow to 40-degree wide span. The soap applicator nozzle gave our car a finish worthy of a showroom. We found that the hose was a great length for most tasks, and large, heavy duty wheels made for easy maneuverability. The TSS is an awesome feature that allows the motor to stop automatically when you are not using the device. This makes the lifespan of the motor and pump longer and saves energy. So, you can relax and use the washer without thinking much about the motor’s durability. If you’re lacking in stature, you may find the carrying handle a little short. 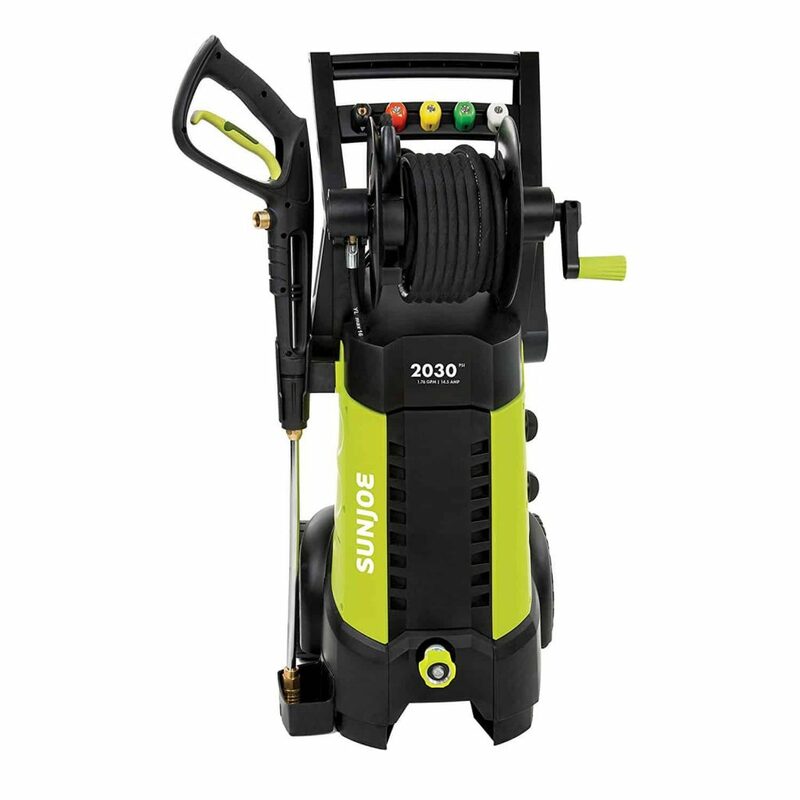 For the money, the Sun Joe SPX3001 Electric Pressure Washer is a great addition to your cleaning arsenal, with plenty of attachments. Providing a decent amount of pressure, coupled with easy maneuvering, and storage, you can’t go too far wrong with this. We’re happy to recommend this washer. The out-of-the-box weight for this Greenworks washer is surprisingly light, but it’s a very sturdy, heavy duty piece of kit, and doesn’t tip over easily. Even though this is high quality & well-built, it’s super easy to assemble. All we had to do was attach the handle using the included bolts and Allen wrench, and fit the hose, leaving plenty of time for coffee. 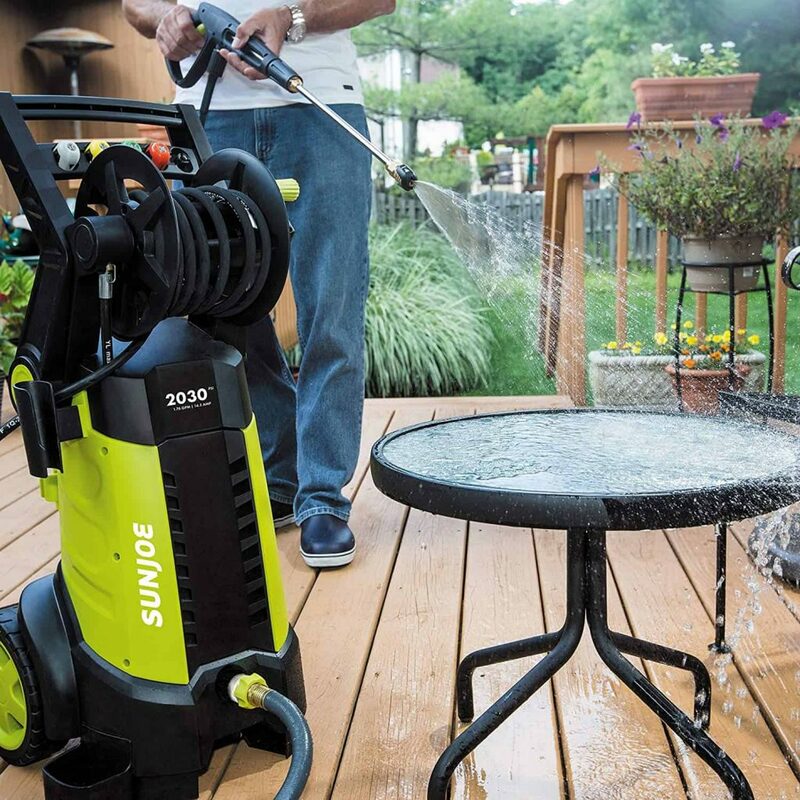 There are a couple of really great things about this pressure washer. The turbo really is turbo, and packs a real punch, easily blasting even the most stubborn grime away. Also, it’s designed so you can store your hose, spray wand and nozzles all neat and tidy on the frame. This is a really handy idea. Finally, we were really pleased with the amount of extra tools that came with this washer – well done, Greenworks! There is a very slight drip from the nozzle when washing which can run down your arm. But we can live with that. 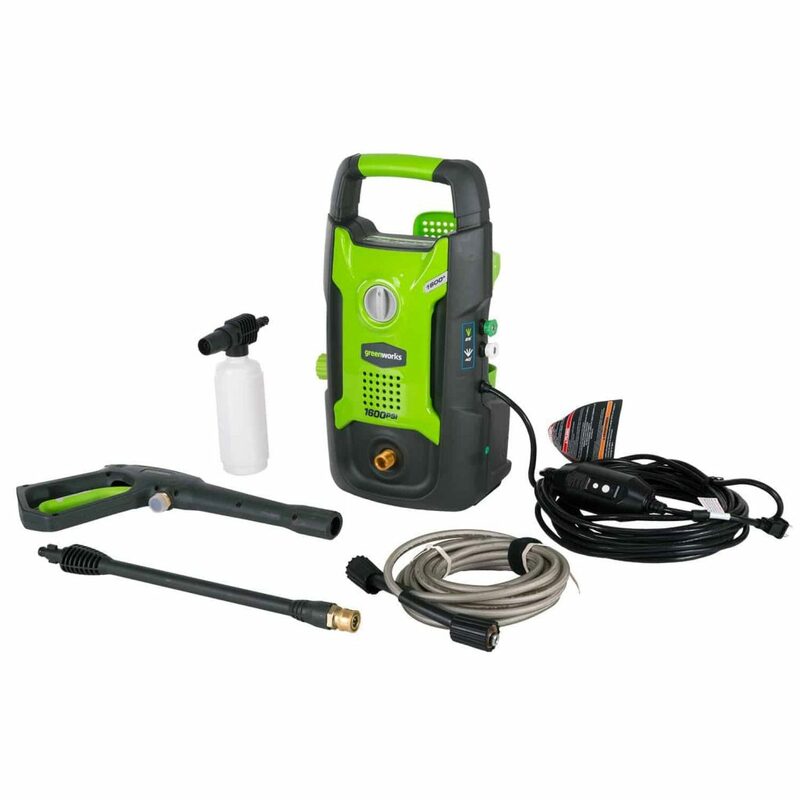 The Greenworks is built to pressure wash forever and a day, making those normally time consuming, troublesome chores super easy and quick. 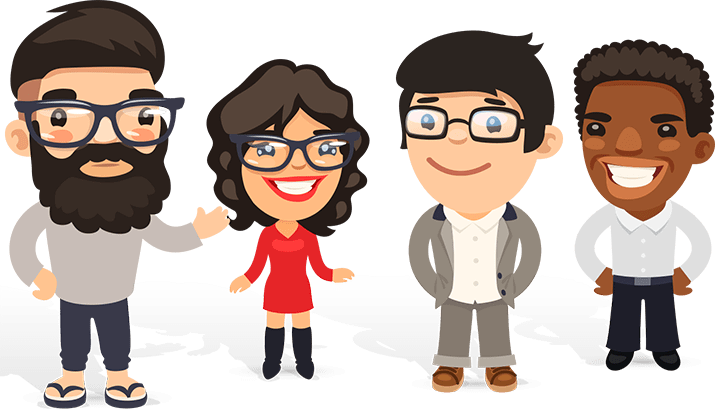 It’s reliable, user friendly and great value for your dollar. 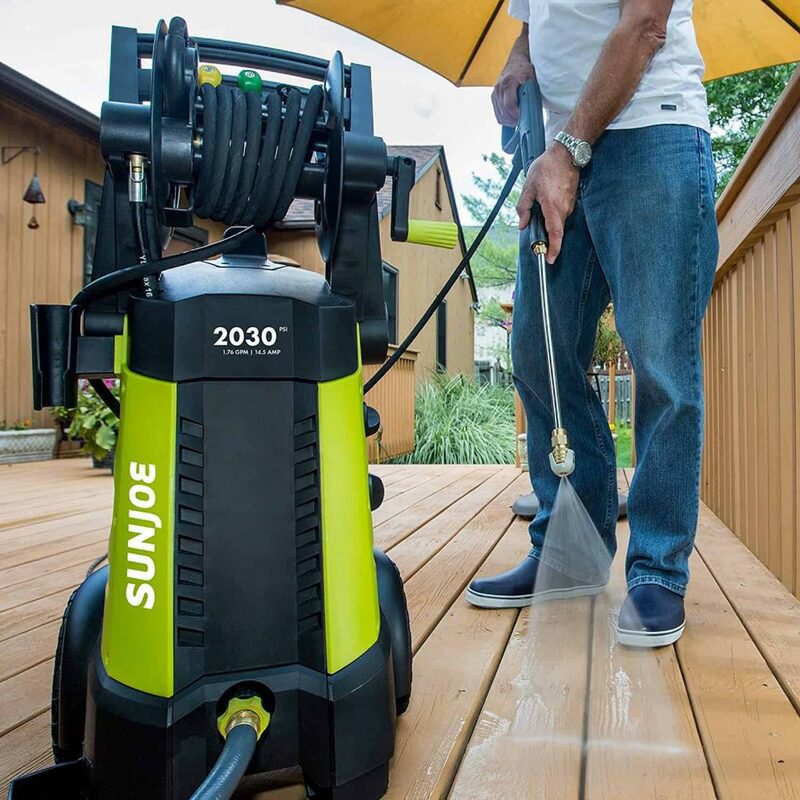 This mean, green pressure washing machine is incredibly sturdy, yet light enough to be easily portable. Coming with plenty of extra attachments, and nozzles, the instructions are simple to follow with clear diagrams and down-to-earth language. 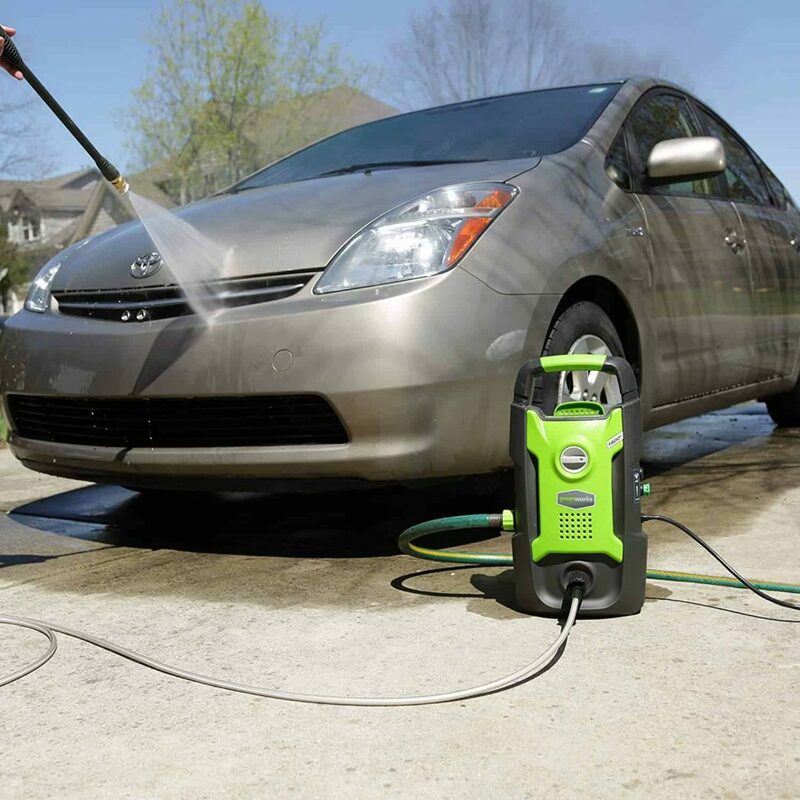 Without gas, oil or toxic carbon emissions, we love how eco friendly this pressure washer is. Great for any heavy duty task, it tackled our slimy decking with ease, and with the longer attachment, we were able to effectively clean the roof, and underneath the chassis, of our SUV. It’s well balanced and remains upright easily, even when being tugged around, yet is light enough to hang on the wall for tidier storage. The nozzle can be a little stiff to rotate to other settings, but this isn’t a deal breaker as far as we’re concerned. This is a great addition to any outdoor equipment. It refreshes and cleans driveways, decking, vehicles and walls with no fuss or bother. Highly recommended.